With Christmas literally around the corner, most Canadians have the house decorated, the menu set... hopefully the gifts have all been selected... Now comes the real challenge, wrapping the gifts! While good things may come in little packages, creative and unique wrapping can elevate any gift, big or small. Nothing says "I care" like a thoughtfully well-wrapped gift. 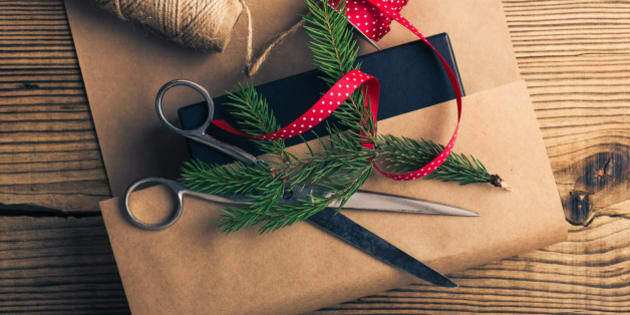 From rustic-home spun wrap to fantastic fabric wrapping, here's an easy "how to" guide for wrapping up your holidays with personality and panache -- even if you are all thumbs. Lend a homespun elegance to gifts by cradling them in simple cardboard boxes (available at craft, dollar and paper stores in a variety of sizes and shapes) tied with thick, brightly hued satin or grosgrain ribbon. Cap off with a bow in a similar shade (using double-sided Scotch tape to ensure a seamless, minimalist look) and a tiny holiday ornament. Write the recipient's name on a manila-paper tag (found at any office-supply shop) to complete the effect. If your hand-writing isn't up to par consider using scrapbook sticker letters in a metallic script font. Freshen up traditional wrapping by trimming with a few natural touches, either real or faux. Think sprays of artificial holly, actual evergreen sprigs or a cluster of glittery-pine cones. Attach these outdoor elements with festive metallic ribbon augmented with a matching silver or gold jingle bell for audible holiday cheer. Gifts take on a sophisticated allure with starkly contrasting wrapping. For a striking back and white look, wrap presents in glossy white paper and trim with jet-black Washi tape that mimics a silky black ribbon. Black Washi tape works well with a variety of shades, from pearl grey to pale blue. Ideal for tall bottles, low bowls, scented candles or festive foodstuffs, see-through cellophane makes for chic and easy wrapping. Simply place the object on a sheet of transparent or semi-transparent cellophane and gather up the edges with your fist. You may want to place a layer of shredded crinkle paper first. Tie the gathered sheet off with ribbon, raffia or cord, depending on the look you're after. Add a customized touch to the gift tag by adorning it with glittery Scotch Expressions ornamental tape. For an off-the-wall take on wrapping paper, substitute the ordinary variety with your favourite wallpaper, especially a print that reflects the gift itself. French perfume wrapped in a fleur-de-lis print, for instance, acquires extra je ne sais quoi, while shortbread encased in a paisley pattern hits home the Scottish theme. Use invisible tape to seal each seam, letting the patterns speak for themselves. Have a handsome or festive bolt of fabric lying around? Consider enlisting it for wrapping duty, be it silk, satin or velvet. Textiles are especially suited as wrapping for smaller objects and sharper-edged containers, such as jewelry, glove and clothing boxes. Use extra-strong tape to bind fabric folds together and to secure ribbon and bows. A beautiful tassel and hand written tag complete this look.